The one who takes her daughter out three days in a row without so much as looking at her hair, let alone brushing it. The one who bribes her three-year old round the shops with a tupperware full of biscuits. The one whose offspring run riot at the front (and in the aisles) of the sweet, calm, well-behaved church-down-the-road that she frequents on weekends when her husband is working and she just can’t take being stuck indoors with both children for the morning. The one whose children lose the plot at their own church. During communion, obviously. Climbing over the altar rail. Hiding under the communion table. Shouting. Screaming. Refusing to listen. Fighting over the lunchbox that contains the chocolate buttons they’re not supposed to be eating right now. So much so that the brilliant vicar takes it upon himself to teach them the meanings of all the carvings on the rail, whilst the service carries on around them. To give everyone five minutes peace. The one who monumentally loses it at the Virgin Media people when they call her, for the twenty-somethingth time this month asking for someone else and then suggesting that perhaps she would, after all, benefit from their services. Which, incidentally, she ALREADY HAS! And then has to make some kind of mumbled apology and smile way-too-sweetly at the cashier who just witnessed the meltdown, so that she doesn’t call Social Services about this poor boy with a crazy-angry mother. The one whose son screams down the entire cafe because, having shaken the pepper pot all over the table, he’s now also decided to rub it into his eye. The one who already feels bad enough about the day she’s having without you staring at her quite so blatantly when she can’t get the stupid buggy into such a very tight gap on the bus. Yes, she knows she’s holding you up. She knows it’s embarrassing for everyone. Trust her, it’s much worse from where she’s standing. The one whose anxiety is rearing it’s ugly head after the fun-but-flat-out-exhausting antics of half term. And making everything twenty times harder than it needs to be. These last few days I have spent a lot of time as ‘that’ mother. Too much. Way too much. I need a rest. Before I had children, I don’t think I ever imagined, not in my wildest dreams, how hard it would be. How many days there would be when I felt as though I had reached my absolute limit. How much attention a three year old needs. How much rudeness a five year old can fit into the 90 minutes before school each morning. How grateful I would be that the Debenhams catalogue comes with stickers inside, buying me twenty minutes writing time while Joel decorates the sofa. We went for a walk last week, with the in-laws, through a beautiful park. Full of autumn leaves, mist and narrowboats. And swings, obviously. We’re not insane. As we drove there we talked about the seasons. About which one is our favourite. Unsurprisingly, given that Christmas is on its way, most of us plumped for winter. But Elvie was keen to point out how lovely the leaves are, and that Autumn’s pretty special too. Those were her words. A treat in every season. Believe me, I’m searching. I’m almost certain that it’s true. That she’s right. She usually is. The treats are there, hiding under the surface. The beautiful plant that I was given by the lady on the flower rota after the service at the church-down-the-road. Despite the kids running wild. That almost reduced me to tears. The teacher who, after hearing at parents evening how Elvie was still struggling to deal with a classmate’s death over the summer, produced three beautiful child-friendly bereavement books at the end of school yesterday. That she’d ordered specially over half term. Telling us to just bring them back when we don’t need them anymore. The man at the bus stop who gushed about mothers, and how unappreciated they are, and how one day we all realise they’re the best friends we ever had. All because I gave him 40p for the bus. Finding a bag of lollipops in the cupboard that never got given to the trick-or-treaters because we managed to be out all evening. And hiding them away so I can work my way through them while the little ones are asleep. The mother on the bus who commiserated with me, and shared my pain over how impossible public transport is with small children. New slippers. Which, thanks to the joys of cashback vouchers cost me a grand total of £2.50. Bargain. And cute too. They’re there. The treats. And I’m hunting for them. I’m trying not to be ‘that’ mother. Not too often, anyway. I really am. And I’m trying not to beat myself up on the days when I just can’t be anything else. Maybe one day I’ll have it figured out. 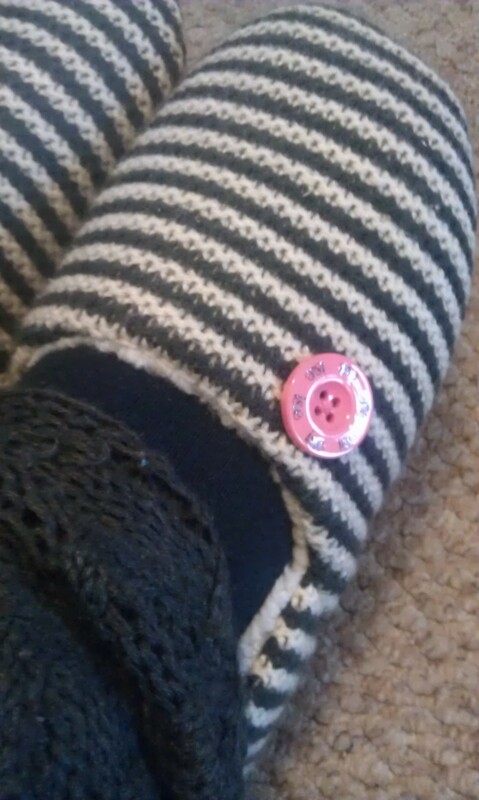 In the meantime, I’ll be wearing my slippers, eating Halloween sweets and reading Elvie books about dying badgers. And I promise, from the bottom of my heart, that if I see you struggling to fit your buggy onto the bus, I won’t stare. I won’t mutter. I’ll get up off my backside and help. So that, even when you feel like ‘that mother’, at least you won’t be in it alone.